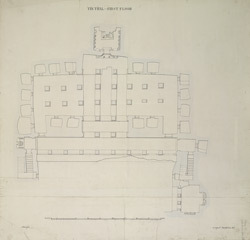 Plan of the first floor of Tin Thal, Cave XII at Ellora from James Burgess' 'Original Drawings [from the] Report on the Elura Caves.' The spectacular site of Ellora is famous for its series of Hindu, Buddhist and Jain cave temples excavated into the rocky façade of a basalt cliff. The works were done under the patronage of the Kalachuri, the Chalukya and the Rashtrakuta dynasties between the 6th and 9th centuries. Tin-Thal is a Buddhist excavation which dates probably from about the 8th Century. It consists of a broad forecourt with three superimposed halls extending deep into the cliff. The pillars are square and have simple brackets capitals. The halls were used for congregational purposes and each was provided with a sanctuary with a seated Buddha and Bodhisattvas.